We offer both on-page and off-page SEO, marketing structure design, and Facebook Advertising.If you have a business, you absolutely need to be doing online marketing. SEO is vital to your online success, and getting it done right is crucial. And Facebook Advertising is your fast-track ticket to building leads, traffic and sales. Don't be fooled by all the noise; SEO myths, outdated information and amateurs are everywhere.Save yourself the burn. I've been in the SEO industry for 12 years, working with clients around the world to improve their rankings and online presence. In fact, one of the world's leading SEO experts, Stephan Spencer, is my father. We build you a strategic roadmap to online success with comprehensive SEO strategies personalized specifically for your business. We will get you traffic from Google, Facebook and other social platforms, and build high-quality, authoritative and relevant inbound links. We will build or improve your sales funnel, create lead magnets and opt-in pages and boxes to build your list and get you more leads, and design you an online marketing plan to maximize conversions. Most must-have SEO tools cost hundreds of dollars a month, but when you work with us you get access to all of the top SEO and online marketing tools free of charge. Fill out your information below and Chloe will be in touch with you shortly to set up your free consultation call. You will discuss your business, your needs and your goals, and Chloe will determine what steps you need to take next and suggest a roadmap to your online success. Stay up to date on my latest presentations and conference sessions, interviews and other press, articles and business development. When Chloe evaluated my site she pointed out mistakes I didn't even know I was making! I've been working with Chloe for less than 2 months, and keep in mind SEO takes a while to show results, but ever since I've been working with her my Google traffic has already increased by 20%. Chloe is so knowledgable about SEO. She made me feel like she genuinely wants the best for for me and my blog. That kind of support is rare.I honestly cannot say enough good things about Chloe! You will not go wrong in hiring this intelligent young lady to help you with SEO optimization. I am thankful for her time and her support of me and my blog! Working with Chloe has been an absolute pleasure. She's friendly and makes what can be a complicated topic easy to understand and digest. Chloe genuinely wants her clients to succeed and doesn't just give textbook advice. All of the tools and techniques are those she has used and found success with. After working with Chloe my website looks much better and my visitors have increased. 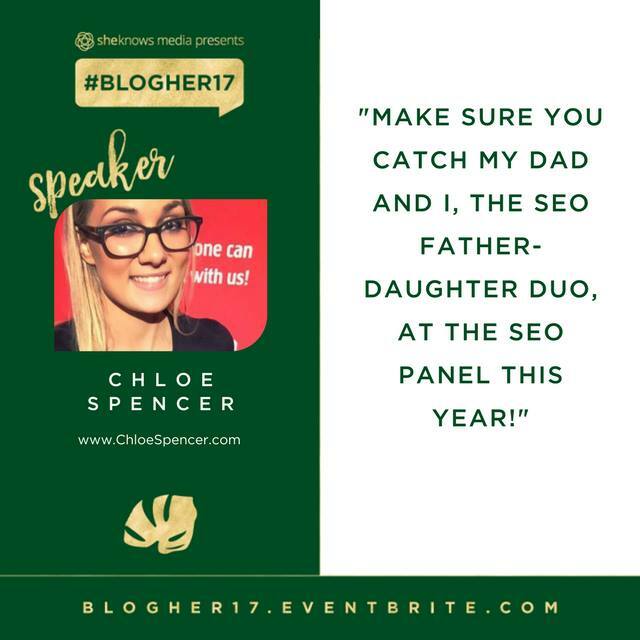 If you are in need of guidance on how to build or increase your web presence through SEO, Chloe is one of the best to go to. I want to say thank you to Chloe Spencer and her services! I highly recommend her and I hope you use her, she's a fantastic, sweet person, she's not afraid to answer ANY question, and she breaks down everything for you very easily!